Stood just outside of the historic Old City in Jerusalem I witnessed scenes of panic as the Israeli army, special forces and police force used rubber bullets, riot horses and sound grenades on Palestinian protesters at this year’s ‘Land Day’ protests. 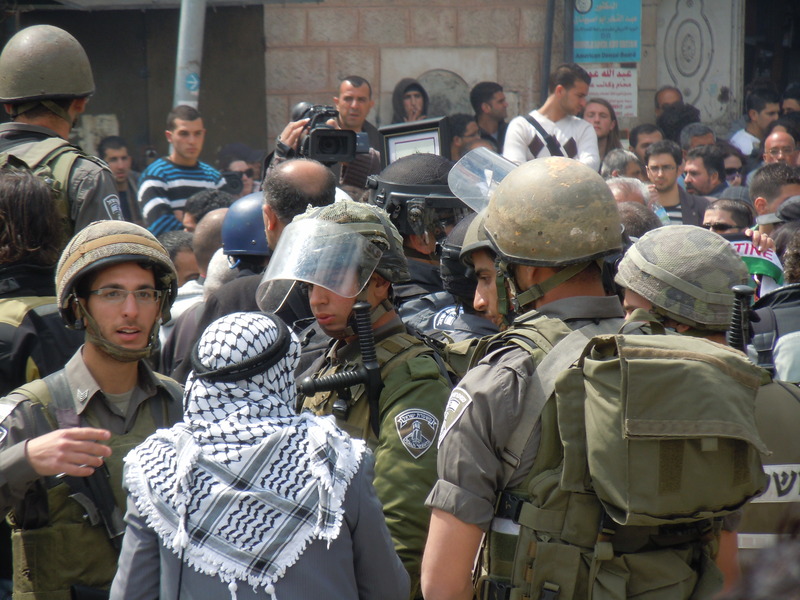 Meanwhile, resident’s in and around Jerusalem saw violence erupt on their streets. Haaretz reported that, at “Qalandiyah checkpoint [protesters] hurled rocks at soldiers, who responded with stun grenades and tear gas” while Ma’an News reported from Bethlehem that “Israeli forces fired tear gas and rubber bullets at protesters”. Al-Jazeera reported that “over 120 people have been injured at Qalandiyah checkpoint”. Before any of the protests started news reached those on the streets that the civil authority in Israel has been covertly setting outside land for settlement expansion in the West Bank. A particularly hard report to hear on ‘Land Day’ of all days. Haaretz ran the headline ‘Israel Defense Ministry plan earmarks 10 percent of West Bank for settlement expansion’. This did nothing to calm the tensions. After the mid-day prayers a few hundred protestors gather outside of Damascus gate in the old city. They were met by a comparable number of soldiers, policemen and special forces. News spread that all men under the age of 40 were banned from entering Al Aqsa mosque. Again, a move that did nothing to ease the tensions. Soon after this, no one was allowed to enter or leave Damascus Gate that leads to the old city. At this stage, the gathering crowd was peaceful (despite reports coming in about injuries and rioting at Qalandiyah checkpoint). With a rising noise level the tension also grew. Early on in the protest the occasional plastic bottle was thrown from within the crowd. This acted as justification for the Israeli Army and special forces to go in with a series of heavy handed tactics including charging with riot horses and letting off sound grenades. Throughout the protest I saw the occasional act of violence from a protester (such as a stone being thrown) which was then responded to with disproportionate force imposed on the crowd as a whole. At one stage, I witnessed a Palestinian throw a stone towards a soldier (and miss). The soldier saw who threw the stone, chased after him and fire what I was told was rubber bullets directly at him (they are designed to be fired at the floor to rebound into legs, not directly at a person). On another occasion I saw soldiers beating men who were simply standing, watching and taking photographs. An international who was with me at the protest commented that she saw, “A soldier head butting a protestor in the face using his helmet. 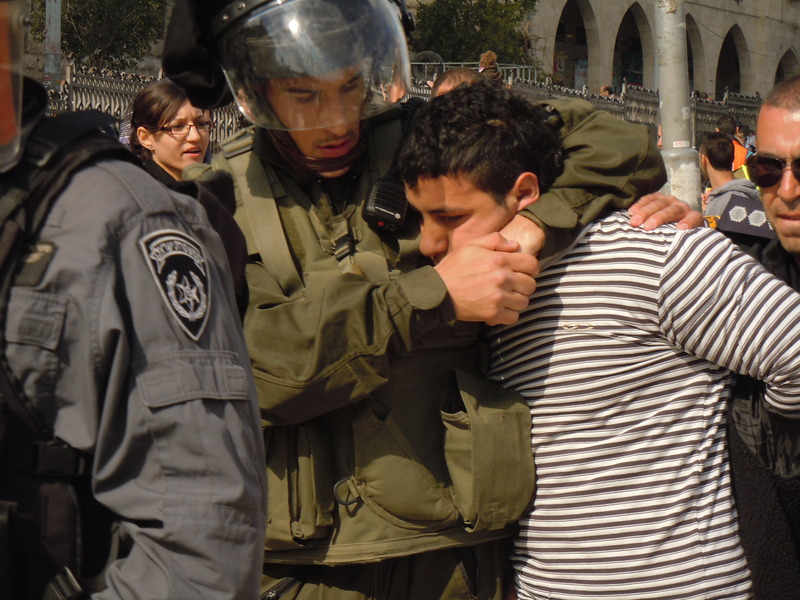 Luckily an Israeli policeman was there to pull the soldier away before anything worse happened”. Throughout the protest riot horses were used to charge at protestors who were not showing any visible threat or security concern. Sadly, I know all too well that this disproportionate use of force at protests occurs all too often throughout the West Bank. A few weeks ago I reported on how the Israeli army breached their own regulations in the way they ‘policed’ a protest at the village of Kafr Qaddum. I left the protest feeling exhausted. I walked back past ambulance workers treating minor injuries and shop keepers attempting to carry on trading. This Land Day has once again seen injuries, arrests and limitations on the basic right to peacefully protest. Outside of Jerusalem there were reports coming in that a protestor had died in Gaza. What I saw in Jerusalem was an unnecessary and disproportionate use of violence against an overwhelmingly peaceful protest. This event however is not unique, it remains the impossible reality for those who are attempting to oppose the occupation through non-violent means. Thanks, Steve. It’s helpful to have straightforward measured observation. Best wishes. Jonathan.